Billy March has been grounded for 63% of the past month. Every time he almost gets his parents’ trust back, his mind wanders off, and he causes another disaster! Like the time he and his best friend Keenan decided to play droid war in a parking lot—and ended up launching a shopping cart into a car. . . .
Now Mom and Dad are threatening to send Billy to a psychologist. They may even make him take brain drugs! But deep down, Billy really worries that Dad wishes he had a different son. He’ll never be as perfect as his sisters. Maybe he doesn’t belong in this family at all. But maybe, just maybe, talking to a “shrink” won’t be as terrible as Billy thinks. 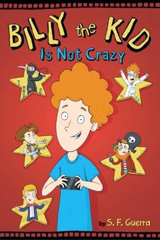 With generous black-and-white illustrations in every chapter and tons of heart and humor, readers will be cheering for Billy as he struggles to find his place in the world—and discovers his true talent in the process.